Have you seen them? They look like big orange plastic price tags, about 1 foot by 2 feet, hanging from trees around the City of Phoenix. Handwritten on one side is the tree's type and some of its attributes, such as the amount of carbon it cleans from the air, the amount of energy it saves, and the value it adds to the property where it grows. On the other side is the tree's annual value to the community in dollars. Don’t feel bad if you’ve missed them. They’ve just started going up this year and about 40 of the city’s 93,000 public trees have been tagged. Sometimes the tags are hung randomly and other times you’ll see them at a city event, such as the opening of a new dog park. Whether the tree is in a park or in front of City Hall, the tags only last about 2 weeks. Then, no matter how high they are hung in a tree, they go missing and are presumed stolen. That doesn’t bother Richard Adkins, City of Phoenix Forestry Supervisor, and the guy whose handwriting is on the tags. Adkins figures they most likely end up in someone’s backyard tree and, at least, will start a conversation about a tree’s value. 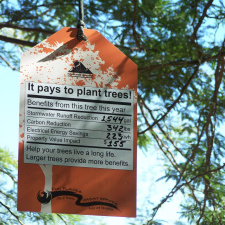 Cities around the country, including the City of Mesa, have been hanging similar tags on trees for several years. This is Phoenix’s first year and the goal is to hang about 200. The tags are part of Phoenix’s campaign to help people understand that trees are more than decorative shade. Currently, Phoenix's tree canopy coverage is 9 to 12 percent of the city’s 520 square miles. Phoenix is committed to increasing that coverage to 25 percent by 2030. It’s an important goal supported by two recent studies. The Cool Urban Spaces Project by the City of Phoenix, University of Arizona and Arizona State University showed that a 25 percent canopy could reduce near-ground temperatures in the city by 4.3 degrees. Phoenix also learned more about the value of its trees by participating in Project Desert Canopy, a state and federal study funded by the U.S. Forestry Service to quantify the value of trees in Phoenix, Albuquerque and Las Cruses, New Mexico, and El Paso, Texas. Removes enough carbon to offset 10,412 cars. Removes 1,770 tons of air pollution. Reduces storm water runoff by 91.7 million cubic feet or enough to fill 23,000 swimming pools. Reduces residential energy costs by $22.9 million. Some trees work harder than others. California fan palm is among the top three most common species growing in Phoenix. Phoenix began planting the palms decades ago mainly to impress tourists. California fan palms are flashy, but don’t give much back to the community. The palms remove less pollution and provide less shade than other trees in Phoenix. They are costly to maintain and harbor pigeons, rats, scorpions and other unwanted creatures. The other two most common trees in Phoenix are Velvet Mesquite and Sweet Acacia, which are both easier to maintain and harbor mostly birds. Here are some trees the Desert Canopy Project found to provide benefits and perform well in the Phoenix Metropolitan Area. You can find more tree information on Phoenix’s urban forestry website, including a video about how to prune your trees and an interactive map comparing tree canopy coverage among Phoenix’s Village Planning Districts. There are photographs and descriptions of other trees commonly found in Phoenix and a link to the on-line inventory where you can review the value of trees in parks or on a street near you. And, by the way, if you happen to find one of those tree tags lovingly handwritten by your city’s forestry supervisor, how about leaving it where it is and taking a photo instead.